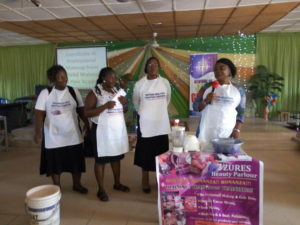 Mustard Seed Faith Christian Foundation, a Non- governmental Organisation (NGO), on Monday organised skills-acquisition programme for women and youths in Kuje Area Council, FCT, on products making, packaging and branding. Pastor Paul Udo, the foundation’s President, said this in an interview with the News Agency of Nigeria (NAN) in Abuja. Udo disclosed that over 50 women and youths were targeted for the training. He said the women and youths were selected from various communities in the area council to be trained in liquid soap making and cream production, among other trades. According to him, the training programme titled: “Think Big Start Small” would bring about ideas on how to brand products, package business to attract customers and access loans from the Bank of Industry. “Our foundation designed this training to meet the growing demands and provide skilled workforce for the country. “The training is aimed at equipping women and youths to become self employed, as the effort will help to reduce crimes in our society and address youth restiveness in the country,’’ the president said. He said that the foundation aimed to empower the less-privileged youths and women through scholarships, entrepreneurship, vocational training to enable them to become agents of change in their respective communities. He said that the training was structured to give the beneficiaries a voice and confidence to cope in a competitive environment and use their hands and mind to create wealth. Udo also said that the training had been spiced with lessons on self-esteem, gender awareness, personal grooming and hygiene. “At the end of the exercise, the participants will know how to nurture ideas and become useful to the society,” he said. He, however, called for partnership and support from the public and government agencies to encourage entrepreneurs for the economic growth of the country. Mr Tunji Omotowa, the Coordinator, Model Skills Training Centre, Abuja, said entrepreneurship was the solution to the country’s economic problems and urged government to embrace it. Speaking on behalf of other participants, Mrs Abigail Oshe, thanked the organisers of the programme and promised to use the skills acquired to become self-employed and carter for her family and the society.